Roll folding is a fantastic alternative to the traditional bi-folded brochure. It allows the advertiser to tell a story or process and is one of the most straightforward methods of brochure advertising. A brochure or paper that is ‘roll folded’ consists of four or more panels folded consecutively in equal portions. Begin by folding the page in half which allows you to quickly measure equal distances and provides a guide for additional folds. Folding it again in half will create the four panels traditionally associated with a roll folded brochure. 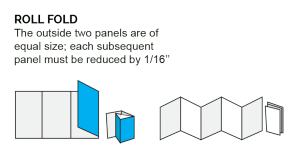 Now that the brochure has been divided into four separate sections, you can refold the brochure correctly by folding each panel, one on top of the other. The previous folding is used merely for easy measurement. When using the roll fold technique with brochures, your content should be well organized, and each panel should have a specific message or purpose. This allows for a perfect opportunity to set apart individual products or content and have them nicely organized on the same sheet of paper. ÃÂ of the original size per panel. When finished, open the folds and lay the page flat. You should see a spiral-like effect with equal distance creases. Roll Folding Is An Advantage In Marketing →← How To Design a French Fold Brochure Using In-Design from Adobe.